The electronics recycling business is becoming increasingly important as volumes of e-waste continue to grow, setting the stage for the growth of that industry. The huge growth of consumer electronics has led to an ever-expanding surge of end-of-life electronics that must be recycled. More than just trash, this material can be an environmental and health hazard. It also offers value in terms of scrap rare earth metals, recycled plastics, and spare parts. With the average life of a computer being 18 to 24 months and new digital products being developed seemingly by the nanosecond, electronics recycling is now the fastest growing segment of the recycling industry. 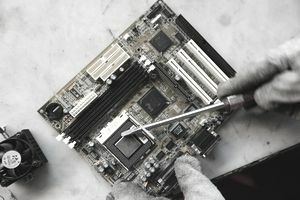 Electronics recycling “is absolutely a growth industry,” according to Lauren Roman, Business Director for e-Stewards, a recycler certification program launched in 2010 by the Seattle-based Basel Action Network, and backed by business and environmental groups alike. Today, recycling is much more challenging to enter because of regulatory and certification hurdles that e-recyclers must now face. In the past, Roman explained, a business could just hang up its shingle, begin collecting electronics and start separating it. Offers would come in for various metals and plastics, and over time the business might take steps to improve its processes and expand its volume of incoming end-of-life electronics in order to turn a bigger profit. The outcome of such an approach resulted in some participants taking unethical shortcuts. This included electronics being improperly dumped offshore and materials ending in landfills where heavy metals could potentially leach out. “Now with e-certification programs,” Roman stated, “you know that the recycler has gone through a rigid certification process. It is a pretty good indication that they are doing the right thing.” There are currently two voluntary certification programs in the United States. One is the R2/RIOS Certified Electronics Recycler program, supported by ISRI, and the other is e-Stewards. The e-Stewards standard, for example, calls for recyclers to eliminate exports of hazardous e-wastes to developing countries; to halt the dumping of such wastes in municipal landfills or incinerators, and to cease the use of captive prison populations to manage toxic e- wastes. It also calls for strict protection of private information on recycled devices and occupational health safeguards. There are also mandatory programs created by several jurisdictions which the entrepreneur must come to understand, where applicable. As for electronics recycling in British Columbia, for example, the Electronics Recycling Standard is enforced by Encorp, which is a not-for-profit organization contracted by the Electronics Stewardship Association of British Columbia and funded through environmental handling fees paid by retail consumers when they purchase affected electronics products. Certification audits are handled by 3rd party inspection companies. Level of Investment. There are various types of businesses in the e-recycling sector, with typical operations ranging anywhere from a few million dollars in annual sales up to $50 to $60 million, according to ISRI. Investment can be quite low for businesses that simply collect, palletize and ship end of life electronics, up to several million for companies that install sophisticated shredding and separation technologies. Time and Expense of Certification. Roman commented that depending on the type of operation, the cost of a certification program could be in the $5,000 to $50,000 range, and take over six months to achieve. For someone serious about entering the business, It is usually a good idea to be working towards compliance in the early stages of creating the enterprise. Site Security. Restricted access and monitoring of the facility are important considerations at most e-scrap facilities, due to the issue of information privacy. Such restrictions are important to a recycler’s appeal to customers and may be written into contracts. Health and Safety. Yet another consideration is the health and safety impact of handling hazardous products. Because of potential exposure to heavy metals, brominated fire retardants and other concerns during the recycling process, recyclers must take care to have such features as adequate dust collection systems, uniform and shower facilities, and other managed safety practices. Legislation. Increasingly, state and federal legislation is impacting the recycling industry and increasing the level of red tape. This, however, may be positive for the industry in terms of promoting a higher recovery rate where landfill bans are enacted, and it may allow for increased processing where offshore export to developing countries can be curtailed. Collection Depots: Keeping with the British Columbia example, the physical flow of electronics scrap starts with authorized collection depots. Encorp contracts over 100 sites in B.C. to accept authorized items, where they are typically palletized according to type (computers, televisions, etc.) and wrapped, for shipment to a consolidation center. Many of the B.C. collection centers also act as bottle and beverage can return centers, which generate much more business than the e-scrap side of the operation. For this reason, Roman suggested that one low-cost way to potentially get into e-recycling might be a collection site. Consolidation Points: Consolidation points are a common tactic in the world of logistics. They allow less than load (LTL) accumulations to be combined into full loads to provide transportation efficiencies. In the B.C. model, the next stop after the collection center is the consolidation center. Encorp runs six such contracted sites in the province. At these locations, palletized products are scaled and cross-docked to create full, uniform loads to send to the recycler. Collectors are paid for their services by Encorp, based on that scaled weight. For a company interested in this type of consolidation business, dock doors to facilitate unloading and loading of trailers handling equipment, and a secure storage area for the product to accumulate are required. In other jurisdictions, consolidation opportunities also exist. Primary Recycling: At recycling operations such as Intercon Solutions, an Illinois-based e-recycler with over 100 employees at its 25,000 square foot main facility, incoming scrap is removed from pallets and de-manufactured by operators who take equipment apart at workstations and sort material into the appropriate pallet bin, including such categories as circuit boards, steel, plastic and glass. At Intercon Solutions, 100% of incoming material is recovered, with zero material sent to the landfill. The result is the liberation of clean material that is subsequently sent to other approved processors. Brian Brundage, CEO of Intercon Solutions, emphasizes the importance of the chain of custody in handling e-waste. For large companies, there are considerations of reputation and liability as well as the need to safeguard confidential corporate information. At eCycle Solutions, a Canadian recycling company, incoming pallets of product are identified and scaled, with a barcode label affixed to each, providing weight and product information. Depending on the type of material, it goes through a manual separation process, or a combination of manual and mechanical separation. Secondary Processing: Clean material is then sent to other operations for further processing. Some of that material, such as copper, may generate revenue for the recycler, while other material, such as glass, the recycler will have to pay to have properly processed. One approach to the further liberation of materials is the use of shredding machinery, which tears apart electronic scrap to facilitate liberation of materials. Material extraction is aided by a number of sorting technologies including magnets, vibration, optical devices and eddy currents. At eCycle, the company operates primary recycling operations in five provinces, but directs applicable material to two sites that have shredding equipment, thereby enjoying better utilization of expensive shredding and sortation machinery at those two locations. Electronics recycling is definitely a growth industry, but as in many other industries, managing regulatory requirements is increasingly becoming one of the keys to success.